Praveen Nishad was the Samajwadi candidate supported by the BSP and other opposition parties in the by-polls that he won against all odds. 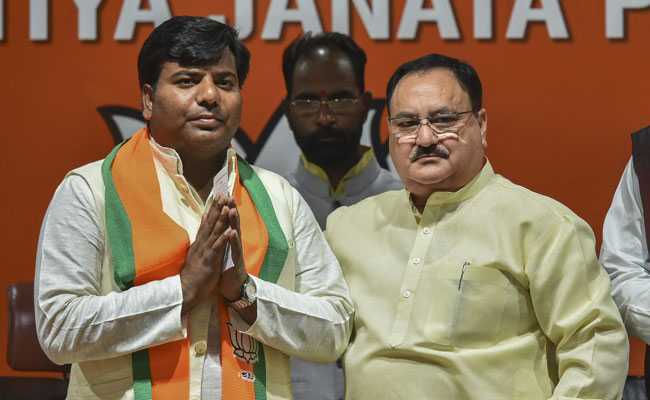 The giant-killer of Gorakhpur, Praveen Nishad, today joined the BJP, the party over which he had won a surprise victory in by-polls last year. The twist in one of BJP's safest seats in Uttar Pradesh, facilitated by the unlikely alliance of arch-enemies Samajwadi Party and Bahujan Samaj Party (BSP), set a template for the opposition gathbandhan for the national election. Praveen Nishad is likely to be the BJP candidate from Gorakhpur in the elections starting April 11. He was the Samajwadi candidate supported by the BSP and other opposition parties in the by-polls that he won against all odds with a margin of 26,000 votes; the BJP's Chief Minister Yogi Adityanath had held the seat for two decades. The BJP hopes to take back what it lost with Praveen Nishad's switch. Gorakhpur has about 3.5 lakh voters from the OBC Nishad community, significant enough to swing votes. But Praveen Nishad's outfit Nishad Party will remain separate and support the BJP in Uttar Pradesh. The group will be headed by Praveen Nishad's father Sanjay Nishad, who founded it. The Nishad Party ended its alliance with the Samajwadi Party-BSP last week. Samajwadi Party chief Akhilesh Yadav and BSP leader Mayawati had successfully tested their alliance in Gorakhpur and Phulpur, the seats of Chief Minister Yogi Adityanath and his deputy Keshav Maurya. Candidates backed by the SP-BSP snatched both seats from the BJP. At a recent press conference in Lucknow, Akhilesh Yadav, with Nishad Party leaders by his side, announced that the Nishad party would be part of the UP gathbandhan. But within 48 hours, the Nishad Party chief met with Yogi Adityanath and told the media his party was not with the gathbandhan anymore. "Akhilesh Yadav had said he'll make announcement on seats for our party. But they didn't put our name on poster/letter or anything," said Praveen Nishad. Akhilesh Yadav also announced a new candidate for the Gorakhpur Lok Sabha seat - a Nishad community leader from his party.